Treatment of aromatic amines with sodium nitrite and HCl leads to the formation of diazonium salts. This process in which diazonium salts are formed is called diazotization. Diazonium salt formation is only possible with primary aryl and alkyl amines. 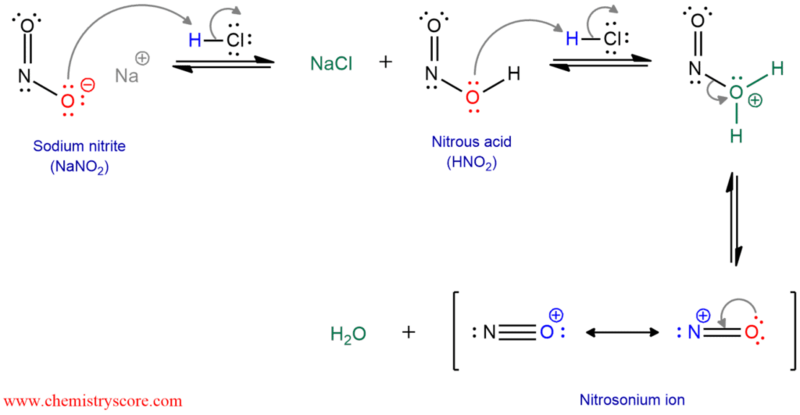 The diazonium salts formation mechanism involves the addition of NO, followed by a series of acid-base reactions that turn the oxygen into water and creates a triple bond between the two nitrogens. The water is then expelled as a leaving group. First, the unstable nitrous acid must be prepared by the treatment of sodium nitrite with aqueous HCl. A nitrite ion is protonated by HCl to give nitrous acid. Then, the nitrous acid is also protonated to form an oxonium ion which has a good leaving group (water). And finally, the departure of the leaving group generates nitrosonium ion or nitrosyl cation. The nitrosonium ion is electrophilic and it can be attacked by amines to form an N-nitrosammonium salt. When water deprotonated this nitrosammonium ion, a stable intermediate (N-nitrosamine) is formed. Then the oxygen atom of N-nitrosamine is protonated, and a proton on the nitrogen is removed by water to form a double bond between the nitrogen atoms. The oxygen atom is protonated again, forming an excellent leaving group (water). The departure of water produces a diazonium ion. Only primary alkyl and aryl amines can give diazonium salts. Secondary amines have just one hydrogen bonded to the nitrogen and are simply deprotonated to furnish the relatively stable N-nitrosamines as the major products. This reaction stops here which means that secondary amines cannot form diazonium salts. 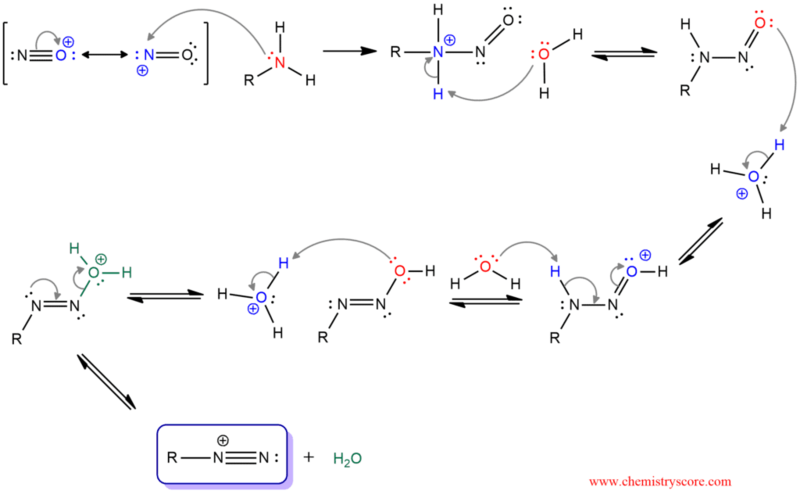 And tertiary amines do not have hydrogens bonded to nitrogen and this reaction does not take place under this mechanism. The nitrosonium ion can be added to the nitrogen but it is also removed in the next step. Formation of diazonium salts is very important because the diazonium group can be readily replaced with many other groups that are otherwise difficult to install. This refers to aryldiazonium salts.